Although it was a light Week 5 in men’s soccer, one player continued his torrid season of goal-scoring as the University of Winnipeg continued to roll towards their second straight undefeated season. That player was Kenny Sacramento. Adding one goal to his league-leading season total of eight in a 4-1 win over University of Saint-Boniface, the 6’0” midfielder continued to prove himself as the best player on the best team, and arguably the best player in the league. A graduate of Daniel McIntyre High School, Sacramento is in his third year of study, but just his first at the University of Winnipeg. 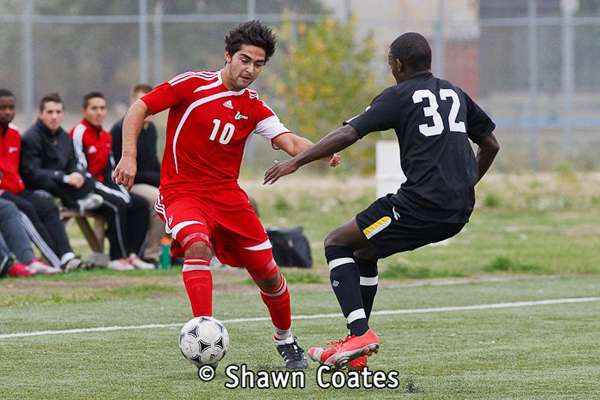 He has a high pedigree of soccer experience, having played for FC Edmonton in the North American Soccer League (NASL) and WSA Winnipeg in the Premier Development League (PDL). Sacramento is working towards a degree in business.